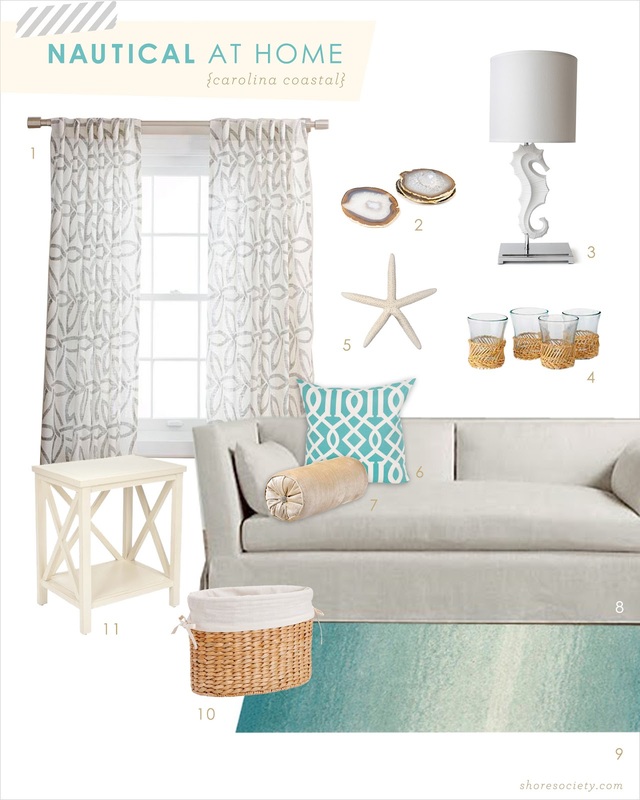 In honor of my upcoming trip to Hilton Head, this installment of Nauti Style is Carolina Coastal—a laid-back, seaside approach to nautical decor. Relaxing spa blues echo the tones of the ocean, and balance with sensible whites, linens, and natural materials to reflect the landscape. Airy curtains let in the light (and the sea breeze) with a pattern reminiscent of starfish shapes. A woven magazine basket also holds all of those fabulous beach reads you just can't travel without. And how cool is this seahorse lamp? I'll be taking the next week off from posting, so I'll see you guys when I get back! If you want to live vicariously through my beach pics, you can follow me on Instagram or Twitter. Hope you enjoyed this little bit of seaside style — catch you soon! I am in love with that seahorse lamp!